Free Shipping Included! 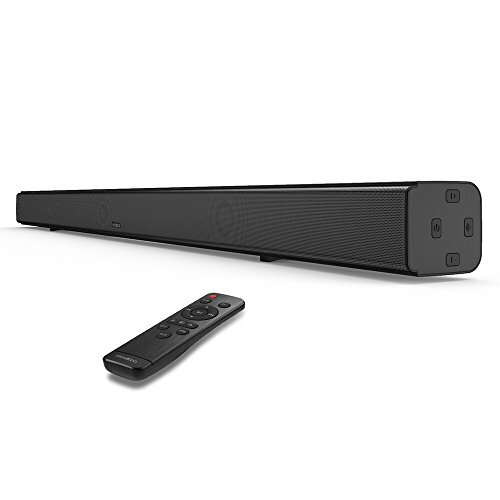 Sound Bar, 32-Inch Deep Bass MindKoo Bluetooth Soundbar, Wired and Wireless 2.0 Channel Home Theater TV Speakers with 4 Full-Range Drivers 3D Surround Sound (Optical Cable, Remote Control Included) by Mindkoo at The Met Theatre. MPN: US#MK-BR02. Hurry! Limited time offer. Offer valid only while supplies last. Immersive Bass: Stereo sound music system with 4 full range high quality speakers that bring the bass and clearly sound, 2 of the speakers adopt dual-magnet driver design to significantly enhance bass; Independent DSP technology for amazing clarity and precision, brings an upgrading optimizing bass output. Convenient Operation: Operates via the in-unit buttons or included remote; LED display and remote control for more convenient operation, meet your different playback needs anytime, anywhere. Easy to Setup: Placed directly under the television or mounted on the wall for a convenient and elegant set up to reduce clutter and save space. No matter how you choose to place it, the rich clear sound will reach all around the room. Wired or Wireless Connection: Stream audio over Bluetooth Within 33 feet effective distance compatible with most Bluetooth devices, or connect via Optical/AUX/USB with the included cables. If you have any questions about this product by Mindkoo, contact us by completing and submitting the form below. If you are looking for a specif part number, please include it with your message.